Because of their widespread pain, people with fibromyalgia syndrome can become very sensitive to touch, and even clothing and bedding can become irritating and uncomfortable. For some people with fibromyalgia syndrome, tight fitting clothes can become uncomfortable, especially around the waist. Loose, floaty cotton and silk dresses can be a good option for women with fibromyalgia syndrome during the summer. Skirts and trousers with drawstring waists can help, because the waistband can be tightened or loosened as required. For women with fibromyalgia syndrome, maternity skirts and trousers with a wide, soft and elastic band at the top that are designed to sit lower may be more comfortable. Buying clothes one size too big avoids pressure at certain points. Always try clothes on before buying, and sit, stand, stretch and bend to make sure that they are comfortable in all positions. Underwear can cause problems – avoid pants and tights that fit closely around the waist, and don't wear socks with elastic that is too tight. Try experimenting with different styles of underwear to find the one that suits best. Some people may find that natural fibres are kinder to their skin. Some people with fibromyalgia syndrome are very sensitive to temperature, but find heavy coats and jumpers painful to wear – try layering soft fabrics like silk, cotton and fine wool, and wear light, soft and warm fabrics like flannel and fleece. Many people with fibromyalgia syndrome have problems with sleep, so it’s very important to make sure that beds are as comfortable as possible, and the bedroom is cool, dark, soothing and well ventilated. Try out mattresses before buying to see if they support in the right places – a good bed or mattress supplier may be able to offer some advice about which one to choose, and some may be available on a 30-day 'try before you buy' deal. Some people with fibromyalgia syndrome may find that ‘memory foam’ mattresses are most comfortable – these are made of a foam that is designed to conform to the shape of the body. These can be quite expensive, but are also available as mattress toppers to go onto a conventional mattress. Water beds can also provide good support and are cooling, but can be very heavy – check whether the floorboards are strong enough first. Latex mattresses are all natural, but some people may have problems with latex allergies. If buying a new mattress is too expensive, covering the mattress with a mattress topper can help – try one made from wool. Wool is soft and supportive, is breathable, wicks moisture away from the body, and is naturally cool in summer and warm in winter. 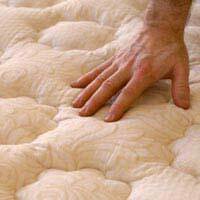 Feather or foam mattress toppers also provide a layer of added softness. It may also be worthwhile looking at new pillows as well – feather pillows can be very comfortable, but they are not a good idea for people who are sensitive to dust. Wool pillows are supportive, and like the mattress toppers, help with moisture balance. Choose bed linen that is soft and comfortable. If sheets feel rough and irritating to the touch, try cotton ones with as high a thread count as affordable. If pressure points around the legs and ankles are particularly painful, invest in a cage that goes inside the bed and keeps bedding away from these areas. I'm surprised no mention is made of how new mattresses can be so toxic in what they are made up of (memory foam, polyurethane foam, glues), but also the flame retardants and other chemicals they put on them. For me personally I got a soft yet firm and comfortable memory foam topped pillow top mattress by Sealy. All that year I experienced increases in sinus, head pain, allergies and didn't put two and two together, lol.After nearly a year when I noticed the smell coming out more, my clothes smelled of it and my hair..I'd wake up feeling way more lethargic , dizzy, nauseous, and "sick" than I had a year or so before. Not to mention the itching and hives on my stomach and legs and face I never had before. It's only after googling what I suspected that I got a ton of info on memory foam intoxication and flame retardants. A few months later I'm still suffering some effects that feel like an aftermath of a prolonged poisoning, but the dizziness morning nausea, skin hives are waning.I feel way different in my mind and even have some personality changes..have some hope, energy and libido I didn't have with that bed.So I'm totally convinced of how toxic chemicals in modern day items that I never knew about or suspected can be. I know they are all over, but being in my mattress, no matter how many layers I put between me and it they got in my skin and my body. It's truly scary and just a warning to anyone else out there looking to buy comfort with a cost of furthering your already troublesome body/symptoms. I have been reading your site tonight and have found most of your tips quite reasonable and useful. Except the following one for clothes...Always try clothes on before buying, and sit, stand, stretch and bend to make sure they are comfortable in all positions. Suffering from Fibromyalgia for 4 years I find I cannot 'try before I buy' The changing cubicles are not big enough to maneouvre in as I have great difficulty in dressing. It is exhausing getting dressed never mind, undressed, dressed, undressed and dressed again in a restricted space as well as attempting to do the aerobics you suggest!! !Although I have not read everything on your site and I realise that not everybody will be in the same position as myself please give a bit of consideration to some of the suggestions/tips you give. Online buying for clothes is much more appealing and relaxing as there is sufficient room and time to try the item on in the comfort and privacy of home. It is not only useful for grocery shopping. A lot of sites now have a 'virtual' changing room which show you the item on a body shape so you can have an idea how it looks.Happy shopping.